OK, I do think brunch is a big deal, don’t worry, I haven’t changed my mind too dramatically in the last two weeks, but in these difficult times with small business owners juggling business rates, the minimum wage, pension contributions and Brexit, these are definitely on the up too - supper clubs! I am hearing about them all the time! Who fancies a little more variety on Tonbridge High Street in the shape of supper clubs? Sometimes they’re in the same place - Sulston’s Kitchen has had a monthly (often sell-out) supper club at his base on Quarry Hill Parade for quite some time; I know that Raspberry Room in Brasted has just started them too in their tea rooms - but often they are pop-ups. Sam Goode has been organising them at locations around Tonbridge with top chefs, Will Devlin has resurrected his No Fixed Abode pop-ups on the back of the success of his restaurant The Small Holding, and then a couple of weeks ago I was invited* to local foodie Jo Banks’s Alive with Flavour pop-up in Oxted. You may recognise energetic Jo from the local food festivals where she often does foodie demonstrations on stage and runs very interactive foodie stalls for children. She tells me that she was brought up with fresh home-grown food cooked by her mum and her passion for food stems from those experiences, being taught by her mum how to cook and making everything from scratch. The key to Jo’s supper clubs is to participate - her aim is for them to be ‘hands on’. Jo gave an excellent history of these Swiss (yes, not French as I had previously thought) eating traditions, as well as providing fondue etiquette (who knew?!) and the all important recipes. For someone like me who adores cheese, I really was in heaven - Emmental, Gruyere and Beauford or Comte can be used and Jo added some Kirsch to give the dipping mixture a slight tang of cherry. 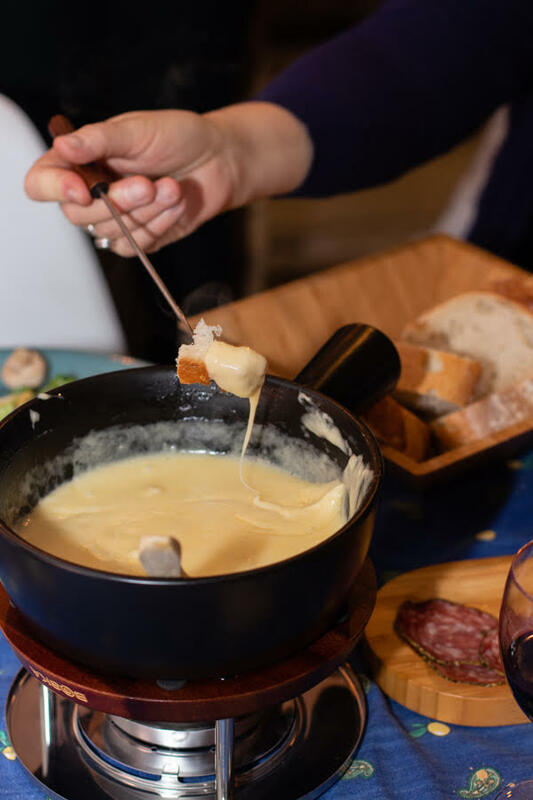 Fondue - is fonduing a verb?! There were quite a few regulars of Jo’s supper clubs around the table (she has just launched a supper club membership) - the food was served ‘family style’ and there was a great deal of bonhomie. Each month Jo hosts a different themed supper club and she moves around too. March is an Indian food night with MasterChef runner up Daksha Mistry which is sold out but April’s supper club (at Hurst Farm Crockham Hill) which is based around Easter is taking bookings. This was definitely an eat around Tonbridge dining experience rather than in Tonbridge but Edenbridge based Jo would love to bring them closer to us here. If you’re a local business with room to host a supper club or if you know of someone who might be interested, do let me know and I can pass your details on. The evening would have cost me £35 and it’s BYO for alcohol. I had a really lovely evening, met some great people and ate food that I wouldn’t normally have on a Wednesday night! It would make a great night out for a group of foodie friends and there were quite a few couples too. So why not try something new?! And if it feels too far away, contact me and I’ll let Jo know that there is demand! * I was kindly invited by Jo so didn’t have to pay.